Have you heard of the "Baked" Brownie? The chocolatey treat that's taking America by storm? Baked is a bakery in Brooklyn, New York. The owners of the bakery authored of one of my favorite cookbooks, Baked: New Frontiers in Baking, and in this book, share their infamously superior brownie recipe with the world. I'd made and loved other recipes from the book (Lemon Lemon Lemon Loaf, Root Beer Bundt Cake, Pumpkin Whoopie Pies), but this is the one that they're truly famous for, so I had to see for myself. These brownies are so good that they've been endorsed by America's Test Kitchen, the Today Show, and are one of Oprah's Favorite Things. Brownies typically aren't my baked good of choice unless there's something interesting about them, like cream cheese, oreos, or peanut butter (or all of the above? mmmm....) swirled in. When I first tasted one, I knew they were excellent, but the best brownies in America? I'd had better. After they rested overnight, though, my opinion changed. Best brownies EVER. Most definitely. The best thing about these brownies is that they'll please a crowd. They're just the right balance of cakey and gooey to appeal to everyone on the brownie-texture spectrum. I dusted mine with a bit of powdered sugar, since that's what my mom always does (hi mom! ), but feel free to leave them naked. 1. Preheat oven to 350 F. Butter or spray with nonstick baking spray the sides and bottom of a 9x13-inch glass or light-colored metal baking pan. 3. Put the chocolate, butter, and instant espresso powder in a large bowl and set it over a saucepan of simmering water, stirring occasionally, until the chocolate and butter are completely melted and smooth. Turn off the heat, but keep the bowl over the water and add the sugars. Whisk until completely combined, then remove the bowl from the pan. Cool mixture to room temperature. 4. Add 3 eggs to the chocolate mixture and whisk until combined. Add the remaining eggs and whisk until combined. Add the vanilla and stir until combined. Do not overbeat the batter at this stage, or your brownies will be cakey. 5. Sprinkle the flour mixture over the chocolate mixture. Using a spatula (not a whisk), fold the flour mixture into the chocolate until just a bit of the flour mixture is visible. 6. Pour the batter into the prepared pan and smooth the top. Bake in the center of the oven for 30 minutes, rotating the pan halfway through baking time, until a toothpick inserted into the center of the brownies comes out with a few moist crumbs sticking to it. Cool completely, then cut into squares, dust with powdered sugar if desired, and serve. Tightly covered with plastic wrap, the brownies will keep at room temperature for up to 3 days. Best brownies ever? I might just have to try - it doesn't even have that much flour - Yay! They look flawless regardless! Haha! Love this post! And the brownies look amazing! Well! I thought I'd found my ultimate brownies earlier this year, but now I think I need to try these. Just to be sure, you know, in the interest of science! I think it's interesting that you liked them better the next day. I've made two brownie recipes lately where I've felt kind of "eh" about them and then was completely in love with them the next day. Thanks for sharing this recipe since I, for some odd reason, still don't own the Baked cookbook. Well they certainly look delicious. Moist and chocolately. All you could want in a brownie. My favourite brownie contains Twenty ounces of chocolate. Thanks to you I have a chocolate craving. I love a good brownie! These look incredible! Two Peas and Their Pod moved to WordPress, please update your readers, etc. Our address is: http://www.twopeasandtheirpod.com Come visit us and check out our new look! Thanks for following us! i just found your blog via tastespotting and i love it :) adding you to my google reader! i have my "best brownies ever" recipe (it'll be on my blog later this week), but i guess i better try these to compare! I agree with you. I made those recently and I think they are just awesome - and I do love brownies. ooh the famous baked brownie! looks good! OH! I thought you meant something else COMPLETELY by the title "Baked" Brownies! WOW! These are similar to my recipe but I love the combo of chocolates- I am going to have to make these babies- thanks for sharing! 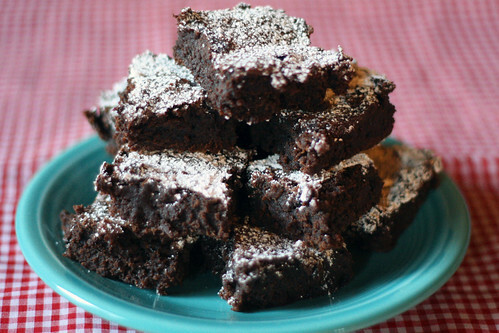 I tried these brownies and they really are awesome... the next day. I iced mine with white chocolate and will be giving most away as holiday gifts. The rest, well my two little boys are raiding the fridge for them everyday! THANKS!